These recipes will surely fill a tummy! Pancakes are arguably one of the most internationally adored dessert dishes. This is because they are so versatile. You can have them sweet or savoury, which also means you can have them for breakfast, lunch or dinner. In fact, pancakes make for an amazing brunch, too! If you only ever eat pancakes at brunch at a coffee cafe in Surry Hills, and are new to making them at home from scratch, it’s not a bad idea to get to grips with a simple pancake recipe first. Then, once you have mastered the basics, you can begin to get creative and experimental with recipes, flavours, ingredients and toppings. For something different and incredibly tasty, try these three deliciously different pancake recipes at home today! Banana oatmeal pancakes are also totally gluten-free and, not to mention, incredibly tasty. You can even make them vegan by removing the egg and adding in extra milk and water. To make these delicious pancakes, all you need to do is whip up the ingredients in a blender until the consistency is creamy but not too thick. Then, in a frying pan, heat some coconut oil (or sunflower oil or vegetable oil) over medium heat. When the pan is hot, simply pour ¼ of the mixture into the pan so it is pancake shaped, and cook on both sides until golden brown. And there you have it! Delicious and nutritious banana oatmeal pancakes that take just 10 minutes to make. Try this recipe at home today and you won’t go back. When asked to think of a “pancake”, the image your brain most probably conjures up is an American-style pancake (think of the pancake scene in the movie Matilda). Thick and fluffy, stacked high on top of each other, and drenched in syrup - what’s not to love? To make these delicious American-style pancakes, simply sift the flour into a bowl along with the caster sugar, baking powder and salt. In a separate bowl, beat the egg and whisk in the milk and melted butter. When it has a nice consistency, pour the egg-milk-butter mixture into the flour mixture and beat together with a fork until the batter is smooth and there are no lumps. Heat some butter on a frying pan over medium heat. Ladle out ¼ of the mixture and pour into a thick pancake shape. Cook the pancake on each side until golden brown, and then repeat until the mixture is all gone. To serve the pancakes, stack them on top of one another and drizzle lashings of maple syrup over them (or whatever you fancy). And, voila! It’s time to dig in. Who says you can’t be healthy when you eat pancakes? By adding some vital greens into your pancake mixture you can give yourself a nutrition boost while enjoying the fluffy and doughy taste of delicious pancakes. This recipe calls for spinach, which results in colourful green pancakes. 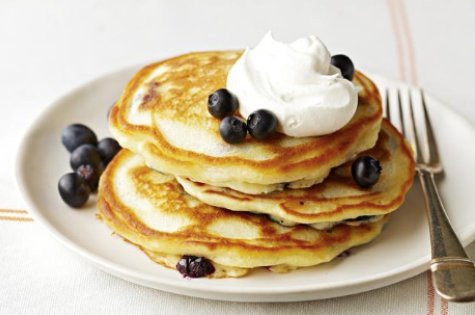 For something different (and healthy), cook up these pancakes today! Once you have the ingredients, the cooking process is easy. Simple ensure that the spinach is washed, and then heat it in a pan until it wilts. Once this has been done, set the wilted spinach aside so that it cools. Put the spinach, wholemeal flour, milk, egg, baking powder and nutmeg into a blender and whiz it up at a high speed until it turns into a batter. Be warned: it will be very green! Heat the sunflower on a frying pan over medium heat, and then pour a ¼ of the mixture into the pan. Cook the pancakes for around 3 minutes on each side, and then cook the next pancake the same, and so on. Stack the pancakes on a plate and top them with whatever you wish! If you want to reach your 5-a-day in one sitting, why not add some blueberries and banana on top - the world is your oyster! Once you have the basic pancake recipe under your belt, you will have free reign to experiment with all manner of ingredients and flavours to create inventive and delicious pancakes. Another advantage of pancakes is that you can always substitute ingredients for others that are suitable for your particular dietary requirements. For example, if you’re vegan or lactose intolerant, you can swap cow’s milk for oat milk or almond milk, for example. Or, if you’re gluten-free, you can use gluten-free oats instead of flour. Take inspiration from our three delicious pancake recipes today, and then make them your own.